A study funded by NASA has flagged up yet another terrible hazard for those no longer able to get excited about nuclear war, global pandemics, terrorism, climate change, economic meltdown and asteroid strike. Top space brainboxes say that even if the human race survives all those, there is a serious risk of civilisation being brought crashing to its knees by a sudden high-intensity solar radiation storm. Beware the space equivalent of Hurricane Katrina. The new study, carried out for NASA by the US National Academy of Sciences, might tickle the palate of even the most jaded disaster connoisseur. 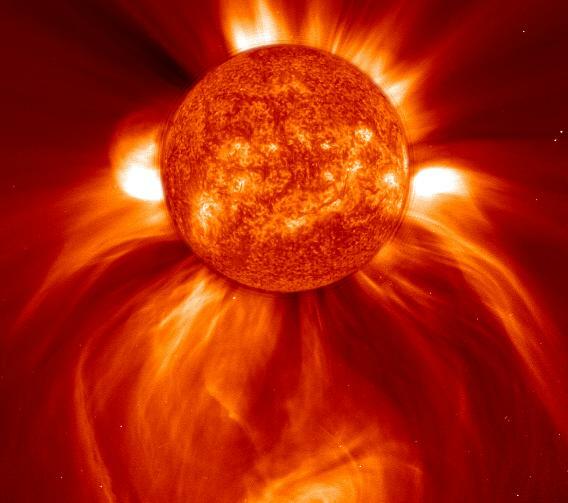 "Whether it is terrestrial catastrophes or extreme space weather incidents, the results can be devastating to modern societies that depend in a myriad of ways on advanced technological systems," says Professor Daniel Baker of Colorado Uni, an expert in atmospheric and space physics who led the report's authors. In essence, the report, which can be downloaded in pdf here (free registration required) says that sooner or later there will be a solar storm much more powerful than any seen so far in the age of high technology. Such events have occurred in the past, but as the human race then had very basic electrical power grids (or none at all) and made no use of satellites, it didn't matter. In summary, present U.S. grid operational procedures ... are unlikely to be adequate for historically large disturbance events. The impact on satellites would be even more severe, as spacecraft have less shielding from the Earth's atmosphere - and in some cases from the magnetosphere. In particular, the present Global Positioning System (GPS) sat constellation, used by almost every navigation system in the world, is regarded as highly vulnerable to a solar event - though new satellites are to go up shortly equipped with a backup signal which will allow errors to be bowled out. In general, however, the assembled brainboxes considered that a solar event was a much greater threat to essential space infrastructure than any evil foreign power - for instance - could possibly be. The US military has previously warned of the risk of a "space Pearl Harbour" - a devastating surprise attack against America's space presence, which could leave the world's sole superpower blinded and crippled. According to the National Academy, though, the USA should forget about a space Pearl Harbour and worry instead about "a space Katrina, a storm that we should have been prepared for but were not".